Lynn Ballard a native of St. Joseph, Missouri, and has been a resident of Greenville County since 1987. 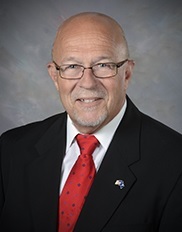 After obtaining a Degree in Chemistry from NW Missouri State University he worked in the Chemical Industry for 25 years - progressing through the ranks from a Laboratory Technician to Vice President of Manufacturing. The final 15 years of his employment he worked as a Rural Mail Carrier for the United States Postal Service, retiring in 2013. Mr. Ballard currently serves on the Public Works and Infrastructure Committee and is Vice Chairman of the Public Safety and Human Services Committee. Mr. Ballard is also the Council liaison to the Alcohol and Drug Abuse Commission, the Chairman of the board of SHARE and a Board member of the Greenville Housing Trust Fund. He works closely with all of the First Responder agencies and special purpose Districts in the County. He is an active member of Washington Baptist Church in Pelzer, SC; where he serves as a teacher, trustee and on the security team. Lynn and his wife, Debbie, have been married for 22 years. They have three grown children and seven grandchildren.